Fortnite Strat Roulette is intended to add extra challenges outside of normal play. You must enforce the rules on your own. Try with your friends for added fun. *If you cant reach the dropzone from the bus path try to get as close as possible, if it is over water drop at the nearest land. *If the Special Rule contradicts any other category ignore that category. Fortnite Strat Roulette is a randomized rule / strategy / challenge generator intended to make playing Fortnite Battle Royale more challenging and interesting. You must enforce the rules on your own as there is no way to change in-game rules from a website. Enforce the rules as strictly as you want, whatever is the most fun for you. Read more about all the rules catergories in the other tabs above. 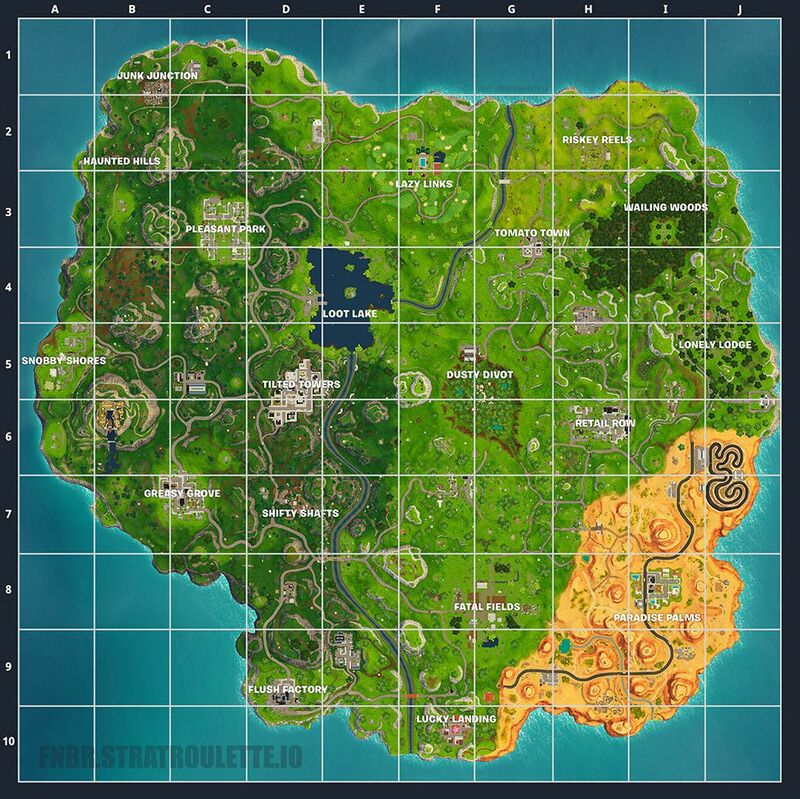 There is also a location only rule page that when you roll only drop zone coordinates or location name will be given with a map highlighting that location. The drop zone rules tell you which coordinates to land at during the round. Press the open map button after rolling to see a map with the drop zone highlighted. The special rule gives you specific instructions on how to play the round. Sometimes the special rule will conflict with another one of the rules. If that happens follow the special rule over any other rule. For example if you get the "Assualt Rifles Only" weapon rule and the "Grenadier: Your only weapons are grenades and melee." special rule. Follow the Grenadier rule and don't use assualt rifles. Fortnite Strat Roulette is a one man project with crowd sourced rules from the awesome Fortnite Battle Royale community. Got a rule suggestion? Drop it in our suggestion box below! Fortnite Battle Royale, logo, photos & text are the property of Epic Games, Inc.